The code of conduct / anti harassment policy for your conference is a great way to outline expected behaviour of everyone who attends the conference and the steps which will be taken to enforce those rules. They’re great things, and help to make marginalised groups in our community feel safer attending events which tend to be dominated by straight white men. But what if the country the conference is in has it’s own strict laws about what is acceptable or not? What if the law of the land makes it clear that certain groups are not welcome and indeed such people are breaking the law by existing and deserve the most strict punishment? Recently a number of conferences have sprung up in the United Arab Emirates. The one that was particularly relevant to my interests is GopherCon AE, as I’ve recently started doing a whole bunch of development in Go and was checking out the conferences available. I’m a gay man. The first thing I look up when I see a conference in a country I’m not familiar with is how its laws affect LGBT people. The UAE is pretty scary in that regard. That was it, and nothing since. The goal of this post isn't to shame this new conference, instead I use them as an example to draw attention to a part the wider issue of safety and inclusiveness that the tech community might need to address. I’m not for one moment suggesting that people in these countries shouldn’t host conferences, or that conferences should only be hosted in countries where gay folks are welcome. However, for a conference to be truly welcoming and inclusive for everyone, it needs to be aware of where it is being held and what is lawful / unlawful where they are. Providing advice for visiting people with regards to cultural differences in the country should be a no-brainer - especially when international visitors might not be aware of them. This might be “all women who are outside must be accompanied by a man”, or “women must cover their hair and neck when outside”, or “men must not wear short trousers” - or even “don’t come, you will not be safe here”. This isn’t a gay-rights issue, or a feminism issue. It’s a cultural and communication one. It requires honesty and reflection from conference organisers - especially those wanting to attract international visitors. 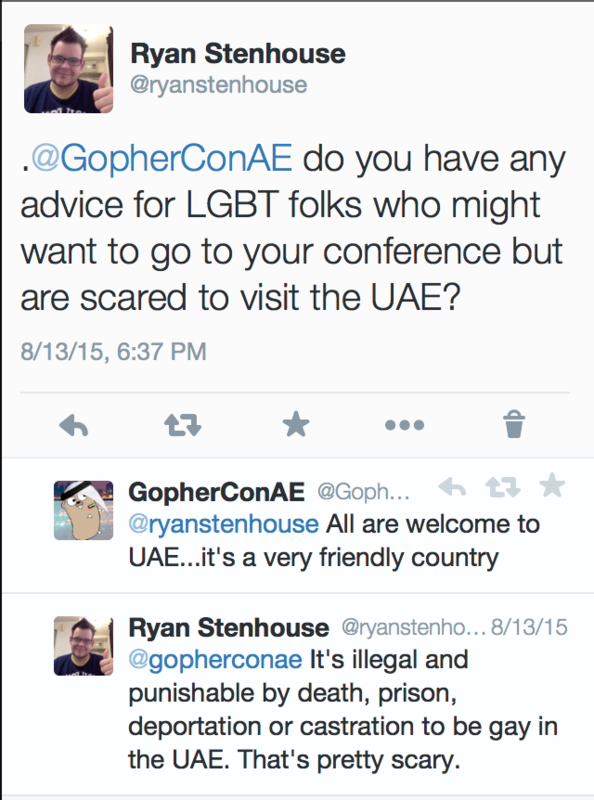 In the case of the UAE though - I’d suggest LGBT people stay well away.